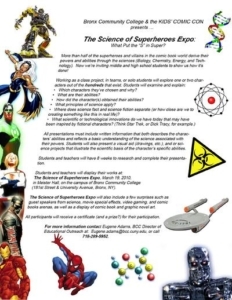 Bronx Community Crime Scene Investigation (BCCSI), an interactive, interdisciplinary science program for the Bronx Community College STEP series. BCCSI provides students with hands on application and understanding of the core math and science skills principles. “My program teaches students to apply science and criminal investigative research skills towards the solving of a fictitious ‘murder mystery’,” says Alex Simmons, (who is also one of the program instructors). “Students use criminal forensic techniques to collect and ‘analyze’ evidence, develop research and observational skills, conduct interviews, and draw deductive conclusions based on the data obtained’,” continued Simmons. Simmons has also used the interdisciplinary structure of BCCSI to incorporates Social Studies and Language Arts as integral components of the instructional design. Along with the scientific research and application students strengthen writing, vocabulary, and critical thinking skills. How Can Art & Technology Help To Teach Academic Subjects? In this workshop Simmons will show participants how to the arts and technology can work together to improve academic interest and studies, building a strong path to a young person’s future. Studying graphic design requires the class to view the world differently. They have to look at it as SHAPES, PATTERNS, SYMBOLS, and SUBTEXT. This method of thought and analysis will affect how they look at literacy, mathematics, social issues, subliminal messaging, cogitative thinking, other matters as well. • Samples of posters, covers, etc. For 13 years Alex Simmons has produced the KIDS COMIC CON, a family event for youth, parents, artists and educators. Co-founded with Eugene Adams and produce with the cooperation of Bronx Community College (where the annual event has mainly taken place). Simmons has created and taught numerous arts and education workshops for this event. Simmons has also lead workshops with other arts organizations including, Behind the Books and the Christopher Barron Live Life Foundation. 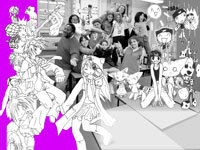 Community School 21 in Brooklyn, teaching his Art of Making Comics Workshops to middle schoolers. The program is sponsored by Behind the Books which send authors into schools to works with young people in the areas of literacy appreciation and the creative arts. School 21 in Patterson, NJ. Simmons will bring his Art of Making workshop to over 80 students who will create, write and illustrate their own comic strip stories. This program is sponsored by the Christopher Barron Live Life Foundation, which will also sponsor a culminating event and a creating comics contest in the weeks to follow.